Tharp Custom Cabinetry has the best clients! Handmade luxury. Exceptional value. Custom creation. If these statements invoke thoughts of your home and inspire daydreams about your cabinetry, it is likely that you already have handcrafted cabinets that make your life more comfortable. At Tharp Custom Cabinetry, we specialize in building custom cabinets and shelving units for home and business owners. We are honored when homeowners choose us to help transform their houses into welcoming, functional homes that are as stylish as they are personal. Furthermore, we swell with pride when we are able to help with the design and building of custom homes that are the homeowner’s dream from the get-go — no remodel required! At Tharp Custom Cabinetry, we work with some of the most talented custom home builders and designers. In today’s post, we want to highlight one of these customers, Wall Custom Homes. Welcome home with Wall Custom Homes! 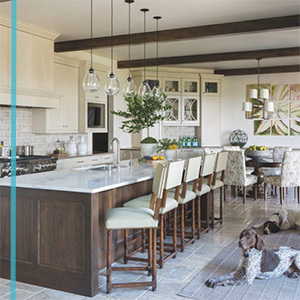 Wall Custom Homes is a Colorado award-winning design-build firm, that has been providing custom homes in the metropolitan Denver area for 47 years — as long as we have been supplying homeowners with custom cabinets. Wall Custom Homes focus on providing the highest-quality homes through their meticulous attention to detail and the commitment to giving their clients only the best. MAME for “Best Custom Home in Denver” (5,000 sq ft to 7,000 sq ft). This incredible home was designed by the Woodley Architectural Group and was built by Wall Custom Homes. At Tharp Custom Cabinetry, we are proud to say that this home features our custom built cabinets that are as solid as the wood they are made from. The Lester home is another featured home custom built by Wall Custom Homes in Centennial. Featured in Luxe . This Centennial home was designed by the incredible architect, Steven Cole, and interior design was done by the talented Nadia Watts. The team at Wall Custom Homes put their trust in our abilities and gave our carpenters the privilege to build all of the custom cabinetry and built-in wall shelves. These two recent award-winning homes are just snippets of the quality work put forth by Wall Custom Homes. Wall Custom Homes has been providing gorgeous custom built homes for nearly half a century. They currently have 33 custom home lots available in beautiful Carr Estates in Westminster. If you are looking for your dream home, design with Wall Custom Homes today! Contact Winston Wall at wwall@wallcustomhomes.com , 303-792-3001. And, if you are looking for custom built cabinetry to put in your current or custom build home, trust the quality-driven team of cabinet-makers at Tharp Custom Cabinetry. Let us help build your dream home today.